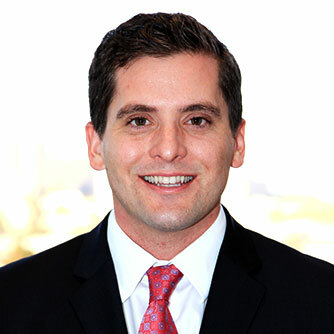 Matthew Stumpf is a trial attorney with Panish Shea & Boyle LLP and specializes in representing individuals who have been victims of serious wrongdoing. He has experience litigating a variety of cases, including large and complex personal injury, wrongful death, and product liability matters. Through dedicated effort, Mr. Stumpf has helped recover more than $300 million in settlements and verdicts on behalf of Panish Shea & Boyle LLP clients. In October 2018, Mr. Stumpf was a member of the trial team that obtained a $41,864,102 jury verdict and subsequent $46,000,000 settlement in a case involving a United States Air Force Captain who suffered catastrophic injuries after being struck from behind while on his motorcycle and then dragged the length of a football field and a half by a Southern California Gas Company truck. The parties agreed to a settlement of the case following the punitive damages phase of the trial, but prior to the jury’s verdict on those damages being announced. Mr. Stumpf was also a member of the trial team with firm partner Brian Panish that obtained a landmark $53,745,374 verdict in February 2018 for two Southern California brothers who were severely injured following a head-on collision with a CRST big rig. Plaintiffs were traveling northbound on State Route 14 en route to their annual fishing trip at Mammoth Lake, California. As their vehicle approached a construction zone absent of K-rails, a CRST big rig driven by defendant Hector Contreras, crossed over the yellow line in the southbound lanes and into opposing traffic, striking the brothers’ vehicle head-on. Throughout the 16 day trial, the defense adamantly argued that the brothers’ injuries were less serious than described but failed to provide evidence to support their position. The jury disagreed and found in favor of the Plaintiffs. In April 2017, Mr. Stumpf was a member of the trial team with firm partner Rahul Ravipudi that obtained a landmark $160,500,000 jury verdict for a man who suffered a traumatic brain injury as a result of a vicious beating by security personnel for a nightclub. Plaintiff, a business professional, spent several hours at a nightclub entertaining and socializing with friends. After paying his bill and preparing to leave, he was stopped by a manager and security personnel who claimed that he had not paid his bill. Plaintiff was then taken to another area of the building and beaten and held against his will by security before being released. As a result of the attack, Plaintiff suffered a traumatic brain injury that resulted in the loss of his livelihood. Throughout the litigation, defendants disputed liability and damages, which were particularly complex. The jury deliberated for less than five hours before returning a verdict for Plaintiff on every theory of liability and also made a finding that punitive damages were warranted. The parties reached a confidential settlement while the jury was deliberating on the amount of the punitive damages to award. In July of 2015, Mr. Stumpf was a member of the trial team that obtained $20,500,000 jury verdict in Jun v. Chaffey Joint Unified School District. The Plaintiff was a mother whose son was killed while walking to his school bus stop. The bus stop had been carelessly and illegally designated at a highly dangerous location that required students to cross an uncontrolled intersection on a five-lane highway. Throughout the case, the defendant hid documents and denied that the bus stop was illegal. By the time of trial, the team brought the truth to light. The verdict carried the jury’s message loud and clear, causing the school district to add policies that put student safety first. A native of Los Angeles, Mr. Stumpf earned his undergraduate degree from the University of Southern California. Prior to becoming an attorney, he worked for many years as a paralegal at an international law firm and began his journey at Panish Shea & Boyle LLP as a law clerk and eventual participant in the firm’s fellowship program.